Cinematic CE is a full-service custom eLearning and CE/CME development company that provides advanced video production services that make web-based training platforms which exceed expectations. Since its establishment in 1994, Cinematic CE has consistently raised the standards for media production companies of all kinds in both quality and value. Cinematic CE was among the first digital photography and video studios in the nation, and quickly became an industry leader in eLearning platform and LMS design and programming. Cinematic CE was also an early adopter of using digital illustration and 2D and 3D animation in a variety of marketing and training materials. Cinematic CE also added a variety of capabilities in interactivity programming as the web became more and more advanced. The combination of expertise on web design, digital video, 2D and 3D animation, database development, and interactive media programming set the stage for its early entrance into the world of eLearning development. Cinematic CE’s extensive experience in developing training videos for a variety of medical organizations and businesses has given the company a solid foundation on how to use technology to enhance video composition quality, rather than simply show off. Multiple camera angles are used to give a wider range of options during editing in post-production, and add visual interest in the final video through switching of angles at opportune moments. Motion graphics help bring viewers’ focus on important on-screen information. Special effects help mark topical transitions in the flow of video content. Dolly shots add smooth panning motions to the point of view, allowing the video to surround a setting or subject and create a sense of depth that makes the video feel more enveloping and thus helps capture and keep attention. 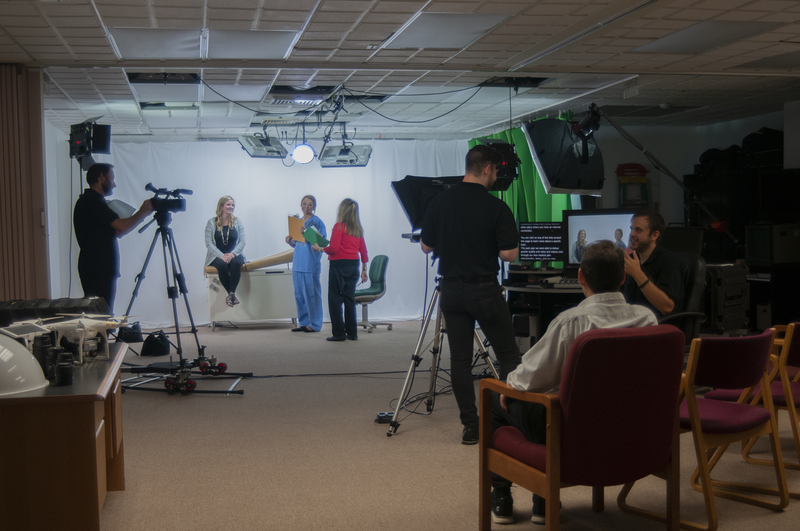 Cinematic CE records video both in its own studios and on location, with a variety of lighting and camera options along with teleprompter support where needed. Cinematic CE also shoots in front of green screen when a custom 2D still or animated backdrop is called for, or a custom 3D environment is to be built for use in post-production. Its sound-isolated recording booth allows for the capture of pristine voice-over narration recordings that add gravitas to educational and training videos and ensure that every word is heard clear as a bell. Cinematic CE also provides casting services from its own Actors’ Network of 48 professional on-screen and voice-over actors. Additional pre-production services offered include scriptwriting by Cinematic CE’s own in-house writers, and storyboarding to plan shots and flow of visuals in the progression of the video. Visual storyboards give clients a basic sense of framing in each scene as well, allowing for more input and control of the developing video aesthetic. Post-production work includes integration of backgrounds when video was recorded in front of a green screen. Custom backgrounds that can be integrated include 2D photographic or custom illustrated backgrounds, 2D animated backgrounds for greater visual interest, and 3D environments when a specific setting is in mind but impractical to achieve otherwise. Cinematic CE also integrates on-screen texts, voice-over narrations, motion graphics, special effects and transitions, lower thirds (to name characters or provide scene information), 2D and 3D animation, and more to create polished final videos that are rewarding to watch. Its animation studios feature many of the same software suites used to produce the animated features known from the largest studios. Cinematic CE is also produces whiteboard drawing animation explainer videos, which are a particularly popular way to tell a story or explain a process in an interesting and easy-to-understand way. Whatever you have in mind, Cinematic CE has the technology and capability necessary to make it happen. Find out for yourself what it’s like to work with custom CE/eLearning developers that can deliver all aspects of a comprehensive video-based training platform in one integrated process. Request a live demo by contacting Cinematic CE today.